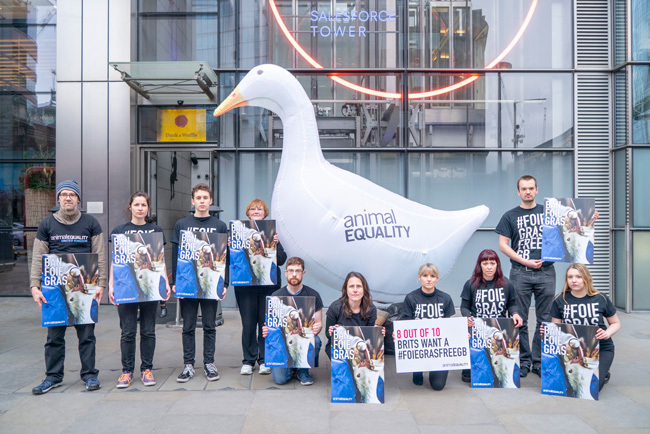 Last week, Animal Equality visited trendy Shoreditch restaurant Duck and Waffle to ask them to drop cruel foie gras from their menu. Joining us was our 3.5 meter tall inflatable duck and our team of dedicated volunteers! 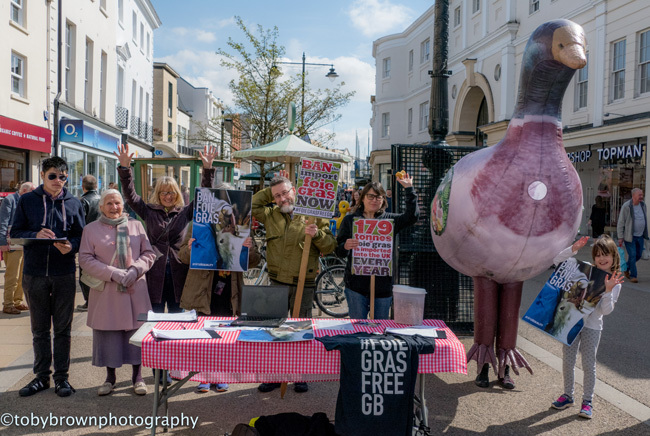 We braved the cold Spring day to raise awareness about the suffering ducks and geese endure in the production of foie gras and to attract public support for our campaign for a #FoieGrasFreeGB. We are asking the government to ban imports of foie gras upon our exit from the EU due to the cruelty involved in its production. It is too cruel to produce in the UK – banned under the Animal Welfare Act, yet we import almost 200 tonnes every year- flying in the face of British values and condoning animal suffering. The government is reportedly minded to ban foie gras if and when the UK leaves the EU, but to date we have seen no action taken. The demo at Duck and Waffle was part of a national Day Of Action happening across the UK, with local activist groups protesting at places that sell or serve foie gras, and in towns and city centres across the country from Dundee to Portsmouth. Each event resulted in a stack of signed postcards for Michael Gove, requesting a ban on imports of cruel foie gras that we’ll be sending on to him with a renewed call for a ban. We’ll also be presenting the petition to him when we hit 150,000 signatures. Help us reach our target by signing and sharing today! Despite contacting Duck and Waffle several times before and after the demo, we have had no response to our repeated asks for them to remove foie gras from their menu. You can help us get foie gras off Duck and Waffle’s menu by contacting them via Facebook, Instagram or email dwreservations@duckandwaffle.com, guestrelations@sushisamba.com and telling them you would never eat at a restaurant that serves this cruel product. For more info about foie gras production and the campaign for a ban, check out our briefing. Together, we can achieve a foie gras-free Britain!